Cave, famous for its maniac shooting games, is releasing an Xbox 360 box set for its shoot'em up fans. Called "Cave Shooting Collection", the box set comes with ten classy Cave titles: Espgaluda 2: Black Label, DeathSmiles, DeathSmiles II X, Do-Don-Pachi Dai-Fukkatsu, Do-Don-Pachi Dai-Fukkatsu: Black Label, Muchi Muchi Pork & Pink Sweets, Akai Katana Shin, Mushihime-sama, Mushihime-sama Futari, and Guwange. If you count the revamped Black Label version of Do-Don-Pachi Dai-Fukkatsu as its own game, this box set technically contains eleven games. 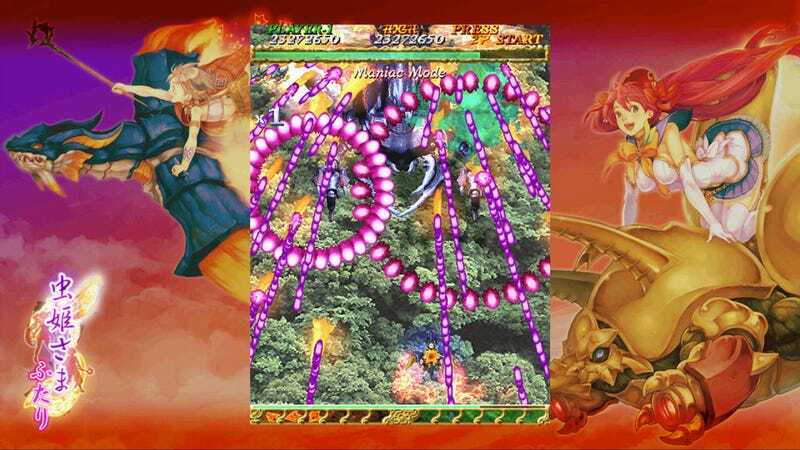 The reason is that while Muchi Muchi Pork and Pink Sweets were released on the same disc for the Xbox 360, they are actually separate games and were originally released as such in arcades. According to Famitsu, pricing and the release date are still TBA. No word on a release outside of Japan.